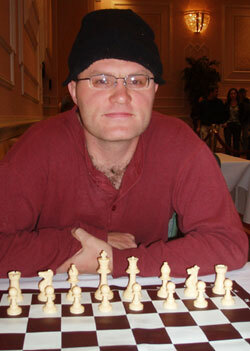 This weekend in Foxwoods (April 4-8 ,Mashantucket, Connecticut), Jesse Kraai earned his third and final GM norm. Kraai's great year actually began in the last days of 2006, when he won his second GM norm in the East Bay Masters.He'll be the first American-born GM in over a decade. Happily talents such as Friedel, Milman and Robson (not to mention Ben Finegold, who has been at the GM strength for many years) make the over/under for the next American-born GM closer to ten months than ten more years! Jesse was jubilant after his game against Shabalov which clinched the norm, although he also feels a bit of existential angst : "I've been trying to get the GM title for four years. Now I don't know what the **** to do." Jesse was proud of his restraint against Nakamura with a3. "A younger me would have impatiently broken everything open, but I would have been wrong." When playing 26...Bb4, Jesse already saw a variation in which Rg3 was impossible. So when Shabalov did blunder with 30.Rg3?, he was ready to pounce with Qxg3 after which fg3 Ne3+ and Black wins. Kraai finally faltered against Zviad Izoria in round 9, allowing the Georgian-born GM to join the winners circle with 7/9. "I regret that I lost this game like a little fish," said Kraai. Izoria thought that Kraai overlooked that after 15...Bc6 16.Qc2 fails to a3!, when White's defenses are stretched to the limit. He can't play b3 because of Nxe4 and if he ignores the situation, the e-pawn will fall. With no other option to defend the e-pawn, Jesse was forced to march forward with e5. After 16...Bxf3, instead of holding onto the pawn with 17.gf3, Qf3 was a more practical recapture even though it loses a pawn after de5 Rd1 e4. White has some compensation there, and much easier play than in the actual game. Gata Kamsky and Zviad Izoria were 1-2 in tiebreaks, so they played a match for the title. Gata won the game in 29 moves. CLO will update this page with the game score as soon as possible. Iryna Zenyuk won a WIM norm. he was born." After a long struggle and several more tense draws offers, the game ended peacefully. Look for Jerry Hanken's in-depth coverage of Foxwoods in the July issue of Chess Life Magazine.